Villa Can Ros is a delightful 6 bedroom villa with a fabulous location just a stone's throw from the sandy Puerto Pollensa Beach. The main resort of Puerto Pollensa, with its stylish marina, restaurants and tapas bars, is also just a 20 minute walk along the coast, so you'll have everything you need nearby. The villa itself has a large private pool and extensive lawn, perfect for families and groups looking for lots of outdoor space. WiFi and air conditioning/heating in all the bedrooms and lounge are included. With a fabulous location, just a stone's throw from Puerto Pollensa Beach, and lots of outdoor space, Villa Can Ros is a real gem. Villa Can Ros has plenty of outdoor space - great for enjoying those hot summer days. The large private pool is set in expansive gardens, with ample room for sunbathing and garden games. There is also a small patio area with a coffee table and chairs, great for relaxing with an evening cocktail. The brick BBQ is close to the pool area. The front garden is also laid to lawn with local Mediterranean shrubs and trees dotted around, providing additional privacy and shade. There is a covered terrace with a dining table and chairs, great for those alfresco meals. The villa is accessed through an electric gate which leads to the front door, with on-road parking for your hire car. The L-shaped lounge and dining room is kept bright and airy by 2 sets of patio doors opening on to the covered terrace and villa gardens. There is comfortable seating, a flat screen TV and an ornamental fireplace, as well as a dining table and chairs. The separate kitchen has an additional dining table with chairs. Traditionally furnished with wooden cabinets and plenty of workspace, you'll be well-equipped for cooking up those tasty holiday meals. The handy utility room is 2 steps down from the kitchen. Villa Can Ros is set all on one level with 6 bedrooms in total. There are 2 double bedrooms, both with en suite bathrooms and patio doors opening out to the villa gardens. One of the double bedrooms is split level with 1 step down to a comfortable seating area and decorated with an intricate mural. 2 twin bedrooms share use of a separate shower room, 1 of which has patio doors out to the pool area. Located 2 steps down from the kitchen is a 3rd twin bedroom and a single bedroom, both of which have en suite shower rooms. The twin bedroom also has doors opening on to the pool area. Villa Can Ros is a detached villa with a wonderful location in a residential area, just 140 yards from Puerto Pollensa beach. There are a couple of restaurants and a mini market close to the villa, or it's just a short 20 minute stroll along the coast to the centre of Puerto Pollensa resort and the marina. Here you'll find lots of stylish restaurants and bars to choose from. The Old Town of Pollensa, with narrow cobbled streets and bustling plazas, can be reached within 10 minutes' drive, or head to the bustling resort of Alcudia, with its chic marina and bars. The weekly market in Puerto Pollensa, held every Wednesday, is great for picking up some local produce or souvenirs to take home. The Sunday market in the Old Town is more traditional, where local people still go to barter for their weekly shopping. For your daily essentials, the nearest mini market is just a few minutes' walk from your villa. Villa Can Ros is located close to the beach, with a local chiringuito (beach bar) offering live music in the summer - great for an evening glass of sangria. Puerto Pollensa, 20 minutes' walk away, has much more choice, with stylish restaurants overlooking the marina and some local tapas bars. Head to Pollensa Old Town, 10 minutes' by car, where you can join the locals for the menu of the day on the cobbled streets. Alternatively, the historic old town of Alcudia, 10 minutes' drive away, has some charming local restaurants and boutique hotels with dining terraces. The crescent shaped bay of Puerto Pollensa has everything you need for a long day on the beach, with soft sand and gentle waters great for families. There are sunbeds and parasols to hire, and lots of chiringuitos (beach bars) meaning you can enjoy a light lunch or sundowner. The small coves of Mal Pas, Cala San Vincente and Manresa are all less than 20 minutes' drive away and offer some great snorkelling opportunities. Alcudia is great for a day of family fun, with its own water park, mini golf and a large go-karting track. Closer to home, the Port of Pollensa has lots of boat excursions offering a wonderful way to explore the stunning coastline. If you're looking for watersports, you'll find scuba diving, sailing lessons, paddle boarding and jet skis all available . The old Roman walled town of Alcudia is well worth a visit and full of history with charming cobbled streets, and a chic marina with lots of bars and restaurants. Pollensa Old Town also makes an interesting visit, with 365 Calvary steps up to the small church perched at the top of the town or relax over a coffee in one of the squares. Or why not head to La Victoria monastery, with spectacular views of the Tramunatana Mountains and the coastline? Pollensa Golf Club, 15 minutes' drive from your villa, offers incredible views of the coastline, with a club house and restaurant. If you're feeling active, hiking in the Tramuntana mountain range is popular in the area. Or why not try out kitesurfing, with many kitesurfing schools in Pollensa? Why not enjoy the experience of drinking the local wines in the vineyards with plenty of bodegas to choose from in the local area. Villa Can Ros is not available to book for season as it is sold out. 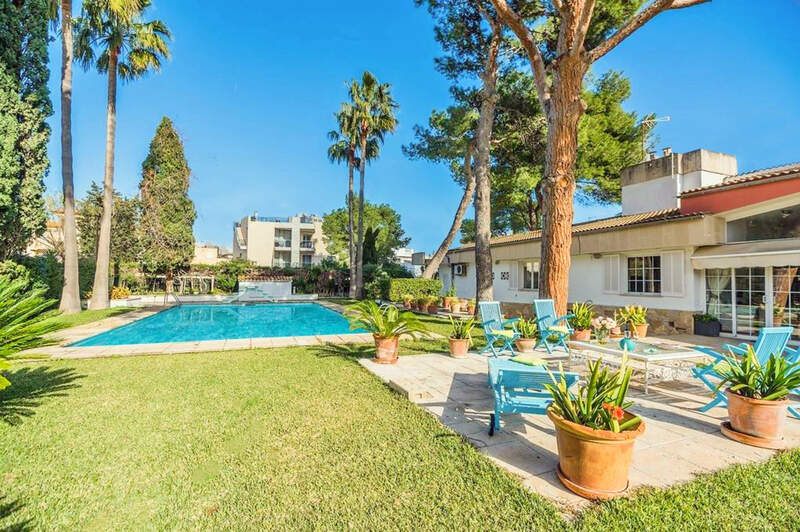 Take a look here at the Majorca villas that are currently on sale.